Unicorn milk brings us a perfect blend of four different cream flavours, mixed with all natural strawberry extract. Yum! 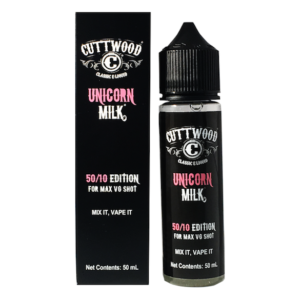 Unicorn Milk eliquid is available as a 60ml short fill bottle, (50ml of eLiquid in a 60ml Bottle) with 10ml capacity for a Nic Shot. We recommend PLUS NIC’s 70% VG nicotine shot if you wish to vape with nicotine.